Infrastructure monitoring is a vital part of infrastructure management, which involves managing the equipment, policies, processes, and other resources that affect an organization’s IT foundation. Two primary management goals are minimizing downtime and increasing efficiency. To accomplish this, IT teams need to collect and analyze data from each component. Several options are available for infrastructure monitoring which can be used concurrently or individually. The SolarWinds Snap Agent (Linux, Windows) gathers system metrics, supports a variety of infrastructure monitoring integrations and also supports log monioring by integrating with Loggly or PaperTrail. 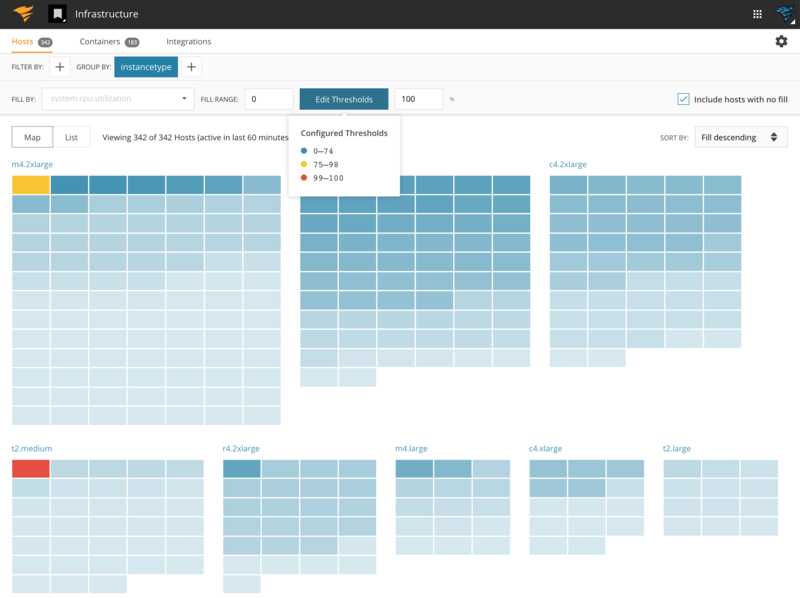 AppOptics can also gather infrastructure metrics directly from AWS CloudWatch. Host monitoring involves data surrounding an individual machine such as CPU, memory, and disk. Installing the SolarWinds Snap Agent will immediately start tracking basic host metrics and give you the ability to leverage one of the many plugins to collect specific metrics. Logs monitoring allows to monitor log files of your system or services and send them to Loggly or PaperTrail. Container runtimes track detailed information about container performance including resource usage, runtime, which hosts your containers are deployed to, and events. This tells you how well your container deployment strategy is working, and which containers need more attention. To monitor containers, install the SolarWinds Snap Agent on the host and we will automatically monitor the containers. To get more fine grained metrics you can also install the agent inside the container. From a billing perspective, we detect that that containers are running on a host and only charge for the host. To ensure that we can tell the difference between containers and hosts, make sure that the agent is installed on the host. The Infrastructure tab in AppOptics defaults to a list view of all hosts that are tracked by the SolarWinds Snap Agent or the integrations. The sub menu allows you to easily switch back and forth between hosts and containers and has a link to the integrations page. You can filter and group the list using tags. If you group on a tag, the list will collapse, grouping the hosts or containers by the tag value. Clicking on a list item will open a side panel with detailed information such as key metrics, tags, and what agents and plugins are used. At the bottom of the panel there are two buttons that allow you to view host logs in either Papertrail or Loggly. Please refer to the Integrations section to learn how to set up those integrations. Another very effective way of displaying your hosts and containers is to use the Map view. Each host or container is represented by a box that you can fill with a color that is driven a metric of your choice. By default, the box hue is driven by CPU utlization. If you click on the color button, you can not only change the color but also set thresholds. That way you can highlight for example if your CPU utilization is reaching a dangerous level. Hovering over a box will show a tool tip with the name and the metric value. If you click on the box, it will open the side panel, just like in the list view.